The original version of this article, by Joshua Zaffos, appeared on Yale Environment 360. Seven dams built upstream in China and the blasting of rapids to improve navigation have already altered flows, reduced fish populations, and affected communities along portions of the Lower Mekong, which flows through Thailand, Laos, Cambodia, and Vietnam. But the impacts may soon get much worse as a new era of hydroelectric dam-building begins in the Lower Mekong Basin. Eleven major hydroelectric dams – mostly within Laos – and dozens of dams on tributary streams that feed into the Mekong have been proposed or are under construction. Xayaburi Dam, a few hundred miles downstream from Huay Luk in Laos, has been under construction for more than a year. In Cambodia, construction on the $781 million Lower Sesan 2 Dam, financed by a Chinese utility, is expected to start in the coming weeks. Laos has vowed to begin work on the Don Sahong Dam, downstream of the Xayaburi, which scientists say would cause significant environmental damage due to the dam’s proximity to the Mekong Delta and Cambodia’s Tonle Sap Lake. Pak Beng Dam, another proposed project, would create a stagnant reservoir, raise water levels behind the dam 40 feet, and back up the river near Huay Luk, forcing the resettlement of communities. Sources: The Cambodia Daily, Proceedings of the National Academy of Sciences. 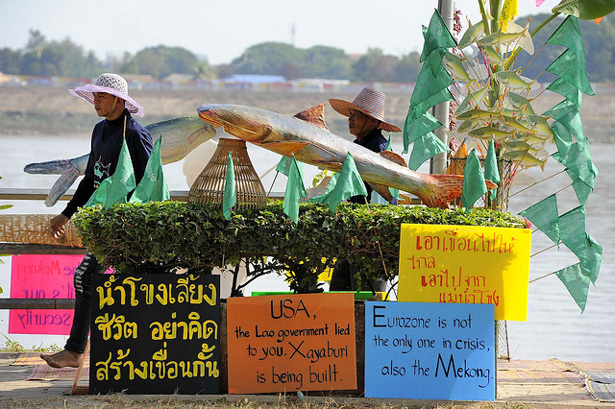 Photo Credit: Thai villagers protest the construction of Xayaburi Dam during a Asia Europe Summit in 2012, courtesy of Pianporn Deetes/International Rivers.